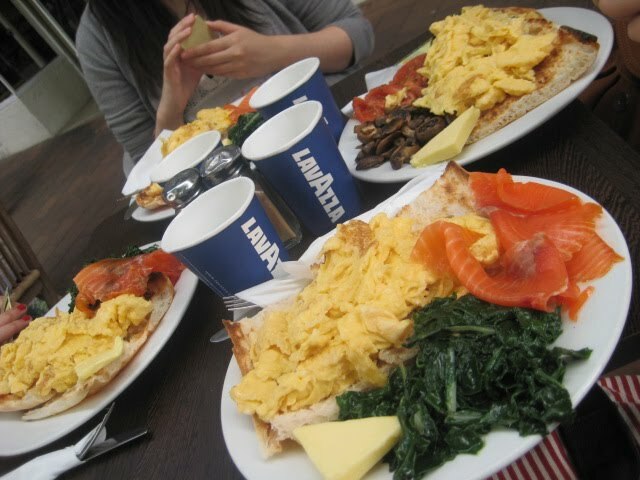 NOTHING beats a good brunch on a late Sunday morning/midday! 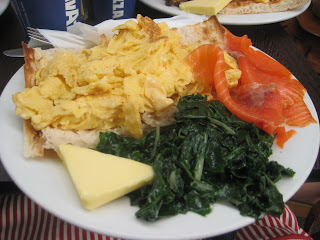 Freckle Face Cafe is a tiny little cafe located near the Kirribilli markets and I dare say it seems like they are doing a better job at serving brunch than the Garfield place right opposite; who stops serving breakfast at 11 on Sunday? Honestly?! Anyhow, we had to wait in line for about 10 minutes or so for a table and somehow they managed to fit the four of us girls onto a tiny little table; luckily, it was tiny enough though. I don't think they had many chefs since it was such a small cafe so with that in mind, the food came out at reasonable time. Everyone pretty much ordered the same thing being toasted bread served with scrambled egg, with the choice of either roasted tomatoes and mushrooms or spinach and smoked salmon. 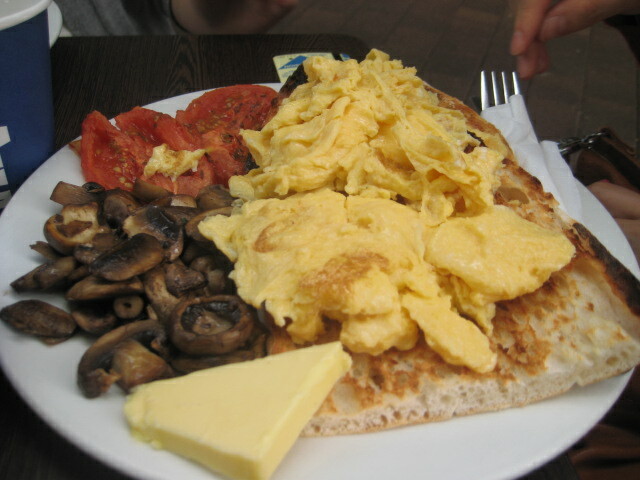 Even though it was priced a bit more than the other items on the menu - the servings and especially the egg was MASSIVE! I couldn't even finish it and there was also a decent amount of smoked salmon as well. The place can only cater for approximately 20 people so if you want to go, you better get there early for a good brunch! 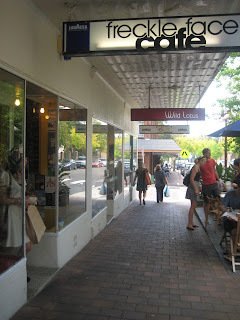 I did notice however that the place gets emptied out at about 12.30 though, that may or may not be too late for brunch. I can FINALLY!! now cross this off my dam eating list! Yes such a shocker that I have not yet been until recently but nevertheless it will definitely be a place i shall return to!! Some people may say it is over rated or crap, personally I think it is actually quite good (and not that bad) but it isn't that AMAZING like how SMH or what other eating guides may say it is. The restaurant is on level 1 of World Square so it is away from all the city rush and because of that it provides a really good atmosphere, especially the glass windows; it doesn't make you feel that you are enclosed in a room. There are A LOT of waiters which is good, the food comes out almost immediately and they also have chefs and assists who wear a mouth mask which goes to show that they do take hygienic issues quite seriously. Though, some people however may be turned off by their lab outfits. Personally I thought it was the best thing ever lol! The food is quite good as I have said mainly because you can taste the freshness in their dumplings and it isn't drowned in salt nor oil (in majority of their dishes). The beef noodle soup was quite average I must say but you could definately tell that the noodles were hand made. Personally I think Shanghai Night makes it a lot better however their beef was tough unlike Shanghai Night. To me, that's a good thing because you know that they haven't used that specific flour which softens the meat so that it is wayyy to nice and tender for it to be proper food. The 'Sew Long Bau' aka pork dumplings were once again average. The only thing which I noticed that stood out was that it was fresh and didn't have that much pig fat as most other places - I could be wrong but that's my analysis from what I tasted. The sauce within the bowl was extremely oily, mainly because of the seasame oil but IT WAS AMAZING!!!!! It was smackful full of flavour!!!! However some may disagree and think that it smells better than it tastes where as I think it tastes BETTER than it smells!!!! They have this as a noodle soup dish too, as per other customers the noodle soup dish is better value for money. Finally, we ordered a small dessert dish, Golden Taro Bread - All I can say that it was the highlight of the meal besides the wontons. It was so nice and crispy and I can say with confidence that it definately tasted better than it looks! The taro was so smooth and went so went with the crispy pastry. It was like food from heaven!!! If you do go, please do yourself a favour and try out this dish! One thing I did notice as well as other customers was that their pictures make the dish look a heap load bigger than what the actual dish is which is a dissapointment. Nevertheless, if you haven't been I would suggest it is a place worth trying! I guess a few reasons why I like this place is because it's quite hidden away from all the main roads and the restaurant is quite small yet popular; it gives it quite a cosy feeling lol. Their waiters can seem a bit rude though based on their facial expressions and other body languages; They seemed to look a bit impatient but in saying that, some other waiters were quite nice. After ordering, we were first under the impression that would be quite expensive because their prices were higher than Chat Thai's and their servings were quite small. The rice was also a very small serving but it came in a really cute heart shape!! The Thai Fish Cakes were pretty average and as most places, the servings for this is quite small. The sauce was a good accompaniment with the cakes and it had a nice thick texture to it. The Paid Sew Yew was a very small serving but it was well cooked, besides the beef. The beef was a tad overcooked hence being quite hard to chew on. The good thing though it wasn't too oily and you didn't feel disgusted after eating it. The Lamb Curry was again small but it was a-m-a-z-i-n-g but it may be that I didn't have much expectations for it. It wasn't the spicy type of curry but the flavours were so well balanced and it just exploded in your mouth. The lamb was really soft and it just went too well with the rice. If I was to go back again, it would definitely be for the curry! The barramundi was average sized and was at market price. The sauce was what made the fish good. The fish wasn't too deep fried but it still had the crispy skin on the outside. The sauce was sweet and just elevated the fish to an extra level. There wasn't that much meat on the fish which is why it was average sized and they added a bit too much ginger which got a bit annoying when it came to eating the fish in general. When it came to pay the bill, we were quite surprised at the total. Without the entertainment voucher (being 25%, saving up to $20), it was approx $65. Dividing that between 4, it came to abouts $16 per person. What made it even better was the entertainment voucher reduced the bill to approx $50 which was extremely cheap. I would say, if you have never been and in the mood for thai and you are somewhere in the city, it is worth trying. If you dont though, I would say you will still live because it isn't that special compared to other thai restaurants. Hidden away from the busy roads of Surry Hills and the Cross is a small street, Stanley Street; the place is almost like a small hidden city itself, filled with several decent looking restaurants but then again why am I not surprised, this is Surry Hills. We didn't go to Bill and Toni's for dinner but I have heard that they do serve massive cheap pastas which fills you up as if there is no other day left! Besides dinner, they also serve really pretty looking and extremely tempting cakes and other patisserie. Looking at it makes you gain 5 kilos automatically!! Sadly though, I only had the gelato but never mind I shall return for more! They did however have a limited range of gelato flavours but the taste itself made up for it. It didn't have the artificial sweetness/flavours (well if it it didn't, I certainly didn't taste it). It actually tasted like they were made from the actual ingredients rather than just pouring in artificial flavours.